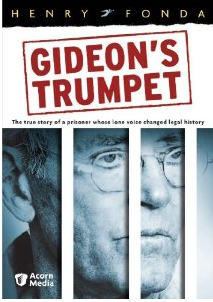 Gideon's Trumpet, written by Anthony Lewis, recounts the story of Gideon v. Wainwright, one of the most important criminal justice cases from the era of Chief Justice Earl Warren. 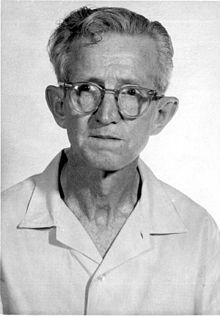 Gideon v. Wainwright (1963) is a landmark U.S. Supreme Court decision. The Supreme Court held that the Sixth Amendment guarantee of counsel is a fundamental right made applicable to the states through the Fourteenth Amendment. Thus, both federal and state courts are required to provide counsel in criminal cases for indigent defendants who are unable to afford to pay their attorneys. Clarence E. Gideon was charged with felony theft in Florida in 1961. At that time, although counsel had been guaranteed under the Supreme Court’s 1932 decision in Powell v. Alabama, the Court's 1942 decision in Betts v. Brady held that lawyers were provided in felony cases only when there were “special circumstances,” such as mental disability or illiteracy. Under Florida law, court-appointed counsel was only provided to indigent criminal defendants in the case of a capital offense. Being too poor to pay for counsel, Gideon was forced to defend himself at his trial. He was convicted and given a five-year sentence. 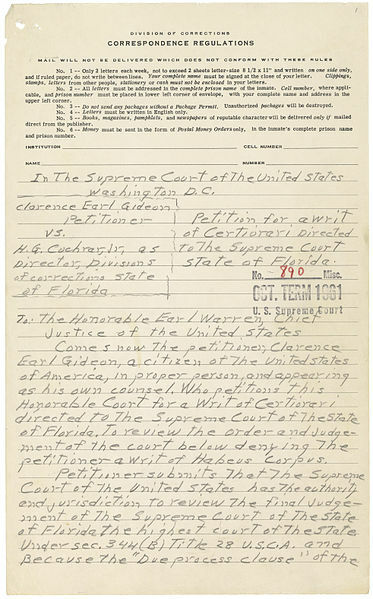 While in jail, Gideon filed a petition for habeas corpus, arguing that he had been denied his constitutional right to counsel under the Sixth Amendment, applicable to the state of Florida through the due process clause of the Fourteenth Amendment. The case was argued before the Supreme Court on January 15, 1963. The Justices ruled unanimously in Gideon's favor, explicitly overruling Betts on March 18, 1963. Since Gideon, the Supreme Court has recognized that the right to counsel is required at all critical stages of the justice process, such as identification lineups, arraignments, preliminary hearings, plea negotiations and the entry of a guilty plea. The more recent cases before the Supreme Court have focused on the expansion of the right to counsel under the Sixth Amendment. However, while the decision in Gideon was intended to provide the benefit of equal rights for criminal defendants regardless of economic status, much of the funding for public defenders and court-appointed attorneys still remains inadequate. Similarly, there is minimal funding for the proper training of these public defenders and court-appointed attorneys. As a result, there has been considerable debate surrounding this "underfunded mandate" in the wake of the 50th anniversary of Gideon v. Wainwright. The following are selected briefs filed in Gideon v. Wainwright. These briefs allow a researcher to understand the issues presented by the case, as well as the arguments made for and against each issue. From his prison cell, Gideon appealed to the Supreme Court by filing a petition for certiorari written in pencil on prison stationery. He argued that he had been denied counsel in violation of the Sixth Amendment. Gideon's Trumpet is also an award-winning film based on the novel written by Anthony Lewis.